DREAMLAND Set to Open Next Week! DREAMLAND, a new performing and visual arts space, is set to open at 810 East Market Street in Louisville, Kentucky with inaugural performances on Thursday, January 30th by the Jim Marlowe/Steve Good/Jackie Royce Reed Trio (their debut) and mAAs, two local music ensembles. Formerly known as the Dreamland Film Center, creative endeavors of all kinds will now be facilitated at DREAMLAND by TIM BARNES, Founder and Artistic Director of THE NEW MEDIA PROJECT. Tucked in an alleyway off East Market Street, right behind Decca Restaurant, DREAMLAND is a 100-person capacity black-box theater with adjoining lounge and lobby space. It has been utilized for the past few years by the Louisville Film Society for screenings, concerts, lectures, and production offices. In a previous life, the DREAMLAND space was a chapel, as part of the Wayside Christian Mission. THE NEW MEDIA PROJECT has been an ongoing multi-disciplinary, multi-media production emphasizing adventures in new music, visual forms, and architecture. Founded by Tim Barnes, THE NEW MEDIA PROJECT aims to expose Louisville audiences to the best of what the world’s art communities has to offer. DREAMLAND’S Artistic Director TIM BARNES is an internationally-known percussionist, electronic musician, and recording producer/engineer who has played and recorded with Sonic Youth, Wilco, Body/Head, Jim O’Rourke, Silver Jews, Neil Michael Hagerty and the Howling Hex, The Tower Recordings, The For Carnation, and MV+EE, as well as being featured in countless multiple other settings, from jazz-influenced free-improvisation to full-on rock n’ roll. He also runs the newly-revived Quakebasket record label (best known for its mid-1990s archival releases of solo work by Angus MacLise, poet and original drummer for the Velvet Underground). Tim is no stranger to curating music events as he had a hand in guiding NYC’s acclaimed Issue Project Room in becoming a venue. A California native, Tim moved with his wife and their two children to Louisville, Kentucky in 2007 from his longtime musical base, New York City. As a relatively-new Louisvillian, BARNES is enthusiastic about reaching out to the entire community in developing DREAMLAND as a viable and vital part of our city. Partnering with BARNES on this endeavor is JOEL HUNT as Business Manager/Publicist, a Louisville native and independent music promoter, best known for his one-man production team The Other Side of Life, as well as his music writing for LEO Weekly, Swingset magazine, and many others. Formerly a resident of New York City, HUNT has also served as a production manager for the Beggars Group of recording labels (which includes Matador Records, 4AD, XL Recordings, and others). DREAMLAND is dedicated to presenting a vanguard of musicians, performing artists, and cinema from around the globe, as well as being a showcase for like-minded artists from right here in Louisville. Our city’s many and varied arts, music, and cultural groups are highly encouraged to consider DREAMLAND as a potential partner in performance and promotion, and we encourage all inquiries. With easy access to and from Downtown Louisville, DREAMLAND hopes to be the artistic and musical beat in the heart of Louisville’s East Market District, also known as NuLu. For more information on how your organization can curate performances and events at DREAMLAND, contact us via email at louisvilleisdreamland@gmail.com. 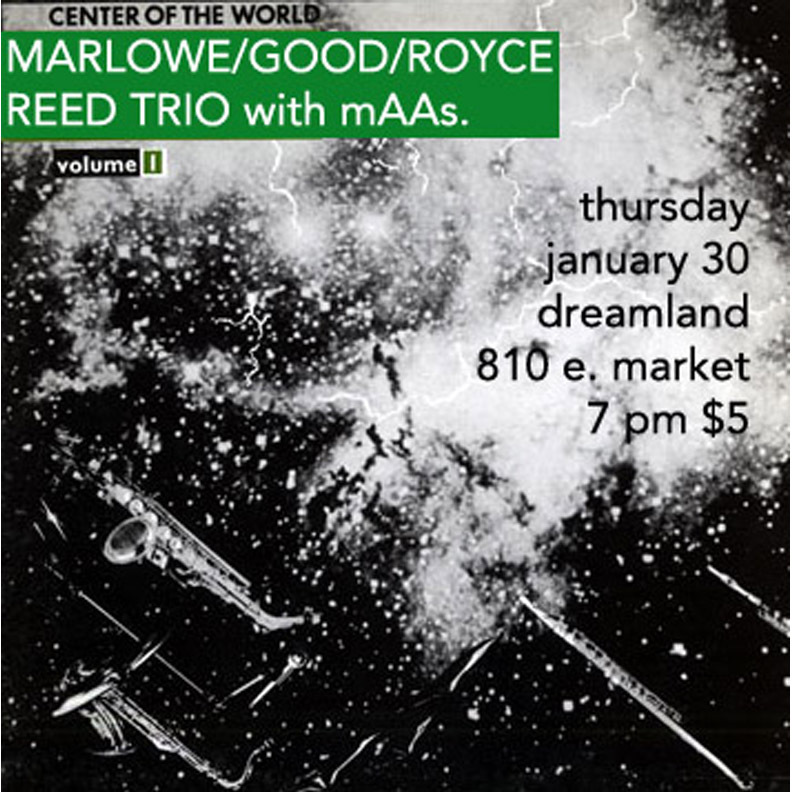 Thursday, January 30th – The New Media Project presents the Jim Marlowe/Steve Good/Jackie Royce Reed Trio and mAAs. 7 PM, $5. Thursday, February 6th – The New Media Project presents Mind Over Mirrors, Matt Christensen, and Shedding. 7 PM, $10. Sunday, February 16th – The New Media Project presents Mikolaj Trzaska & Tim Daisy Duo, more TBA. 7 PM, $10. Wednesday, February 19th – The New Media Project and The Other Side of Life present Chris Forsyth’s Solar Motel Band, more TBA. 7 PM, $10. Saturday, March 1st – The New Media Project presents Cairo Gang, Tropical Trash, Famous Laughs. 8 PM, $10. This entry was posted in Activities, Art, Beer, Dreamland Events, Film, Other People's Shows, Upcoming Events and tagged DREAMLAND, The New Media Project, Upcoming Events on January 24, 2014 by othersideoflife.